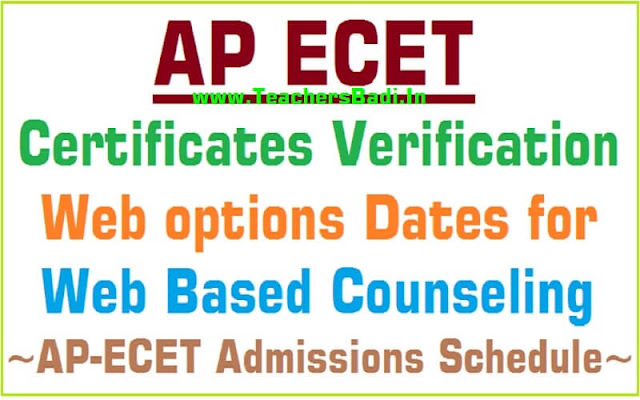 Final AP ECET 2019 Certificates verification, Web options, Seat Allotment Dates: AP ECET 2019 Certificate Verification Dates/APECET.Org AP ECET 2019 Verification of Certificates,Web options, Seats allotment - AP ECET 2019 Admissions : A Common Entrance Test designated in full as Engineering Common Entrance Test for Diploma Holders and for B.Sc. (Mathematics) Degree Holders and in short as ECET [FDH and B.Sc. (Mathematics)]-2019 will be conducted in every year by JNT University, Anantapuramu on behalf of the AP State Council of Higher Education for the academic year 2019-2019 for B.Sc. (Mathematics) degree holders. (ii) For lateral admission through Common Entrance Test into 2nd year regular B. Pharmacy Course in both University and private un-Aided professional institutions (Minority and Non-Minority) approved by Pharmacy Council of India. Final Phase AP ECET 2019 Certificates verification, Web options, Seat Allotment Dates: Qualified and eligible Candidates of A.P-ECET-2019(Diploma holders of all branches of engineering and Pharmacy & B.Sc. Maths) who have participated in first phase Counseling are informed to exercise their options afresh using their old password, Login Id for the leftover seats now available and consequential vacancies that may arise in the process of allotment, additional seats available in new colleges/courses, if any from any Help Line Centre or Internet facility (Café/Home) as per the schedule given below. The Candidates Who have not attended for Certificate verification during first phase should get their certificates verified as per the schedule from any Help Line Center and exercise options as per the schedule given below. 1. Candidate who has secured seat but not shown interest to join in the allotted seat. 2. Who have not secured seats so far, but got their certificates verified. 3. Who have not exercised the options so far, but got their certificates verified. 4. Who have secured seats, reported and aspiring for a better option. 5. Who have reported/Not reported but cancelled their allotment. 1. Options given in the 1st Phase will not be considered for this Phase of admissions for allotment of a seat and candidates have to exercise options afresh. 3. Candidates who are satisfied with their previous allotment need not exerciseoption once again. They shall note that if they exercise options now and a seat is allotted as per the options, the vacated seat will be allotted to next meritorious candidate and hence they will have no claim on the previous allotment. 4. It is advised to exercise options for interested colleges/courses assuming that vacancies would arise in all colleges in the process of sliding. pay processing fee online before he/she attends certificate verification. Processing Fee to be Paid: Rs.1200/- for OC/BC and Rs.600/-for SC/ST. 1. Processing fee can be paid online by the candidate using credit card or debit card or through net banking. 2. Visit https://apecet.nic.in and click on processing fee payment online. 3. Enter APECET Hall Ticket number and rank and click on pay fee online. 4. The candidate will be directed to payment gateway. 5. Select any one mode of payment i.e credit card or debit card or net banking and enter credentials. time of verification of certificates. 7. Candidate shall note that he/she shall have paid the processing fee when candidate attends for certificate verification as per the schedule and ranks mentioned against each date. i.e the processing fee should be paid online by the candidate before he/she attends certificate verification. Note 1:Candidates passed from boards of examination other than SBTET shall submit equivalence certificate from SBTET. Diploma or B.Sc Degree Examination are only eligible for admission. 7. Andhra Loyola Degree College, Near Benz Circle, Vijayawada. approach nearest Help Line center with valid proof. JNTUA has issued the AP ECET 2019 notification on 02nd February, 2019 and the University invited online applications from the eligible candidates from ...-03-2019 through online mode at its web portal apecet.org. Students who were applied for this stream, they were appeared the engineering common entrance test 2019 which was conducted on ....-05-2019 by 10 AM to 1 PM. The results of entrance test were released on ....-05-2019 and appeared Candidates are checked their results from ap ecet web portal apecet.org. The Qualified candidates of AP ECET-2019 (Diploma holders of all branches of engineering and Pharmacy & B.Sc. Maths) from ....... who have attended certificate verification earlier are informed to exercise options on ...-07-2019 till 06.00 PM using their old password and Login Id for the seats now available and consequential vacancies that may arise in the process of allotment from any Help Line Centre or Internet facility (Cafe/Home).The candidates who have not attended certificate verification so far can get their certificates verified from any one of the Help Line Centres on 06.08.2019 and 07.08.2019 and exercises options immediately after certificates verification till 06:00 PM. • Candidates who have secured seats but not interested to join/Not reported. • Who have secured seats, reported and aspiring for a better option. • Who have reported but cancelled their 1st Phase allotment. • Who have not attended certificates verification so far can get their certificates verified. Note:Options given in the 1st Phase will not be considered for allotment and candidates have to exercise option afresh now. Candidates who are satisfied with their previous allotment need not exercise options once again. They shall note that if they exercise options now and a seat is allotted as per the options, the vacated seat will be allotted to next meritorious candidate and hence they will have no claim on previous allotment. However, the Special reservation Category Candidates (Sports/NCC/CAP/PH) who did not get their Certificates verified earlier should get their certificates verified now at Govt. Polytechnic (Near Benz Circle) Vijayawada only. Allotments will be placed on the website on ....-07-2019 after 6.00 PM. For vacancies and other details please visit: https://apecet.nic.in It is advised to exercise options for interested colleges/courses assuming that vacancies would arise in all colleges in the process of sliding. 5. Study Certificate from IV to Diploma (9th class to degree in case of B.Sc). 8. Telangana/ Andhra Pradesh Residential Certificate of father/mother for a period of 10 years excluding the period of employment outside Telangana/ Andhra Pradesh from Tahsildar in respect of Non-Local Candidates. 9. Integrated Community Certificate, Aadhar Card and father’s Caste certificate in case of BC/ST/SC issued by the competent authority. 10. Income certificate issued on or after 01.01.2019. 11. Candidates claiming reservation under NCC/Sports shall bring the original certificates. PH Candidates shall submit certificate issued by the District Medical Board. CAP Candidates shall submit Certificate from Zilla Sainik Welfare Board, Discharge book & Identity card for Verification. Children of Ex-Service and In-Service persons who are domicile of Telangana/Andhra Pradesh alone will be considered for allotment of seats under CAP Category. 12. The Muslim and Christian Minority Candidates should bring TC of the SSC containing the Religion (Muslim/Christian/Other linguistic) or in the absence of TC, a Certificate issued by the Head of the Institution in which the student studied/appeared for SSC or its equivalent. The Candidates of SC/ST category have to pay Rs. 800/- While OC/BC/Minority candidates have to pay Rs.1200/- towards the Processing Fee. In addition, every candidate has to pay tuition fee as prescribed by the Govt. The SC/ST candidates are eligible for reimbursement of Tuition Fee if parental income from all sources is up to rupees two lakhs per annum and all other category candidates whose parental income from all sources is up to rupees one lakh per annum are eligible for reimbursement of Tuition Fee as decided by Government from time to time.